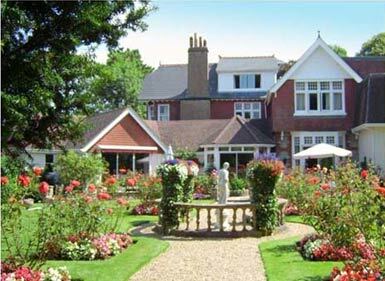 The Country Garden is a delightful hotel (just 16 rooms) located in the tranquil West Wight area and is set in lovely gardens that are a riot of colour most of the year. All rooms are quiet and comfortable and most have garden or garden and sea views. Resident proprietors Matthew and Beverley and a charming loyal staff of islanders are determined that every guest shall be delighted with the overall service, ambience, and special touches that will make your stay a pleasantly memorable one. Ashley Courtenay sums it up perfectly as "a really superb hotel set in beautiful gardens" adding that "here, too, you will relish the superb cuisine" in one of the Isle's finest restaurants. No wonder 70% of our guests return again and again. We are just a five minute stroll to the Solent, with easy access to lovely walks or hikes including Tennyson Downs and The Needles, and an eight minute drive to the bustling sailing port of Yarmouth. Golf is available within a 10 minute drive, as is horseriding and a modern sports centre with tennis, badminton, basketball, swimming, fitness centre etc. Our choice of twin, double and single (with double bed) rooms are all en suite with bath and shower, feather and down pillows (non-allergic pillows available), duvets, bathrobes, TV, radio, fridge, telephone, central heating, hair dryer, and coffee/tea making facilities. Ground floor rooms and public areas have wheelchair access, and one room is specially adapted for the less abled. Our bar, lounge and dining room all have views over the gardens which are floodlit in the evening to extend your enjoyment while having after dinner drinks or coffee on balmy summer nights. Our locally popular elegant nonsmoking restaurant is a relaxing environment for your freshly cooked English breakfast, or enjoying the daily multiple - choice table d'hôte and à la carte menus. Our Chefs have experience in delighting our guests, buying superior quality produce and creating only the best of cuisine including vegetarian dishes. Local fresh seafood (Dover sole, lobster and crab among others) is available much of the year.